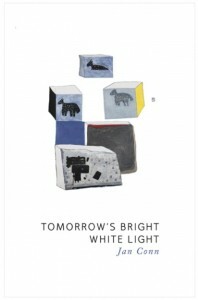 Jan Conn, Tomorrow’s Bright White Light (Toronto: Tightrope. 2016). Paperbound, 54 pp., $19.95. A sock particle was detected in the supercollider. Can we make time out of bacteria? Trade genomes for another year of elephants? but the scheme itself is silk. So begins the poem “Battered Civilization,” which also opens Jan Conn’s ninth book of poems, Tomorrow’s Bright White Light. I had the privilege of choosing this poem for the 2014 edition of Best Canadian Poetry; I was struck, in part, by the disparate knowledge and tones that collide so surprisingly in these first speculative images. The domestic sock meets the hyper-technological realm of the supercollider. Bacteria, that could be living in a Petrie dish or on your bathroom sponge, are fodder for a conception of time as makeable. What desperation makes an attempt to quantify our relationship with an entire species, commodify the knowledge of genetic science, and appeal to some ancestral sense of fairness by suggesting the barter system? This interesting voice then turns inward, and reveals personal desire, or failing, and a poet’s taste for metaphor. In the first lines of this poem, we hear the registers that Conn balances in the rest of the book—one, a biological scientist’s technological savvy, curiosity and observing distance, and two, a more personal voice that shares a woman’s everyday, domestic, and fleeting joys. We also get a taste of a recurring concern for the environment that bridges these two realms of experience—the personal and the scientific—in Conn’s restless, interrogatory, and sometimes surreal poems. This poem, which ends with the lines “The power grid cannot be managed, the northwest perimeter / held against us,” is a good example of the kind of leaping, fragmentary consciousness that is so particular to Conn. The varying subjects of verbs—first person, then second, with some subjectless interjections or directives thrown in—leave the reader unsure who the speaker is. One is reminded of the fragmentary sentence-craft of the L=A=N=G=U=A=G=E poets, but something other than the orthodox poststructuralist intention to destabilize the reader’s sense of a single subjectivity propels this writing. Our readerly desire for a stable vision informing each poem, for a narrative structure giving it a sense of meaning, is being challenged here. Yet, through the slow accretion of the poems, Conn builds up a sense of voice and experience that suggests a body, a person with a history, behind the writing—one who needs to leap with language in order to use it effectively, to grapple with what it is to live on this Earth. The disjointedness makes sense ecopoetically: the scale of environmental change, and the acuteness with which a biologist would be aware of it, is often perhaps beyond coherence, beyond narrative logic. The poem “Touch Me Anywhere to Begin: A Biography of Eva Peron” is a series of single lines that looks deceptively like a list: “She was spotted in an estancia near a river. // Every day being videotaped by a tiny tribe of microbes. // If a person is infallible, she has to draw the line somewhere. // For a carnival she dressed as the unknown. // A local parade of sequined donkeys passes through her. // Do you pledge in favour of control or glory?” The poem moves like this, the tone objective and dispassionate, as though a multidirectional microphone is picking up phrases from the psychic buzz of Peron’s mythology. Stabs of intimacy are followed by macro-level observations of Argentinian society: the eye that sees what “passes through her” also sees “rampant forgery at every level.” And here is Conn’s oblique humour: the same voice that refuses storytelling will draw a picture of microbes using video equipment. At the poem’s close, it is as though we have moved through the atmosphere of Peron’s politically charged life. Not all the poems in the collection are this exaggerated in their disjointedness; Conn does write narrative poems which are easier to follow, though even these often unfold their stories in a stepping-stone to stepping-stone, stop-motion rhythm. The Latin American poems give context to the poems from closer to home. Poems about getting lost on a summer drive somewhere in southwestern Ontario, about Lac Mégantic, or about pressures to own a condo, feel connected to the poems about people living in tropical landscapes, in or on the fringes of mines. One trusts that Conn looks at herself and us as animals busy anthropogenically changing the planet, with the same fascination, passion, and equanimity that she brings to her study of Anopheles darlingi, the bugs that spread malaria. Conn imbues her work with a sense of biological, rather than geopolitical, time. There is hopefulness in her voice that looks for “tomorrow’s bright white light,” but one senses, by the end of this collection, that Conn’s vision anticipates not a glittering future but the blinding immeasurability and imminence of our collective extinction. Her voice feels at times matter of fact, as if Conn imagines her poems as a byproduct of a human being at the end of a cycle of Western civilization’s values and ecosystemic balance. But her dry, clean tone is surface to a deeply phenomenal wonder. The humanity and vulnerability of Conn’s voice, which shows itself in controlled glimpses, is one that measures its surroundings, and finds hope in that place where two modes of attention, objectivity and sensitivity to beauty, meet each other with profound respect.